The beauty of a great social enterprise flows from its design. It’s not only the product, but the utility this product will serve and the understanding that great ideas dictate design, on every level of operation. In other words, a brilliant social enterprise takes a lot of deep thought. The berlin based architect Lars Krückeberg and Wolfram Putz, co-founders of the award-winning, innovation driven architecture firm GRAFT, are one of those people who are not afraid to dive into every aspect of what’s involved in. Back at the beginning of 2010, Krückeberg explains during a TED talk, they met Andreas Spiess, another Berliner lawyer who deals among other things in the field of renewable energy in developing markets. This meeting took place at a lobby hotel in Addis Ababa, where the two were working on deferent projects in Ethiopia. The discussion developed around a serious and common problem in the 3rd world. Energy, or better the lack of it. More than 16% of the world population still lack access to electricity. In the rural areas, where this population lives, infrastructure for this electricity will not be created in the coming decades – it’s simply too expansive. But the people who do live in those off-grid locations, use energy. They use it to cook, to heat, even to create energy to charge their mobile phones. But it’s dirty energy, often toxic like paraffin, sometimes wood from the local surroundings, destroying in the process the local habitat. And worldwide, the cost of this energy adds up to 30 billion dollars. The solution that was created was simple and effective – a Solar Kiosk. Simply put, it’s a kiosk that sells good’s like much of other parts in Africa, the local small version of a convenient store. It also sells electricity, sometimes even internet connection, and in the future perhaps mobile access. But it is also so much more than that. First and for all, Krückeberg describes it as a social & E-hub. It’s a commerce center that is the corner stone for a market square in rural locations. For example it is used as a selling point for solar lanterns, replacing the dangers of paraffin lights with clean energy. It can also serve as a water purification station, a place to store medicines in a refrigerator, a copy, print and scan station and above all a charging point using the powerful solar array on its roof. It’s a little piece of architecture that has a business case and provides so much social value, while doing it clean. And due to its modular design, it can grow by adding modules into new forms of structures. Among them a movie theatre, health center and even a refugee camp. 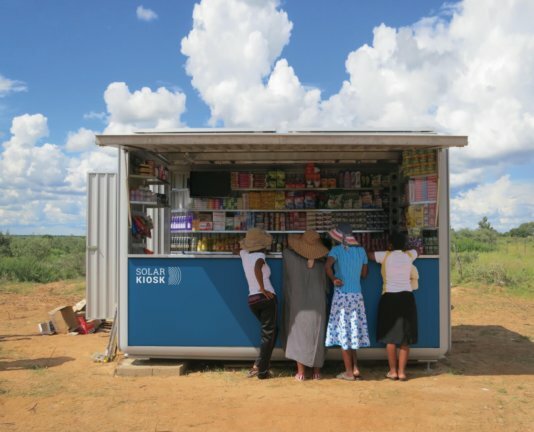 From 2011 till today, the German company Solar Kiosk, run by Andreas Spieß and Lars Krückeberg, has installed around Africa 45 Kiosks, impacting the lives of more than 330 thousand people. It sold through these hubs 3770 solar products, generated 120k KWh of energy each year and empowered in the process 90 women operators and assistants. 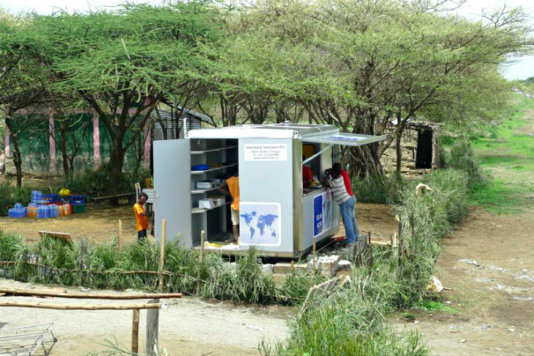 Unlike typical charity projects the solar kiosk is driven by a entrepreneurial approach, designed to be profitable, bottom-up, and thus sustainable. The SOLARKIOSK is used as a selling point for solar lanterns, replacing the dangers of paraffin lights with clean energy. 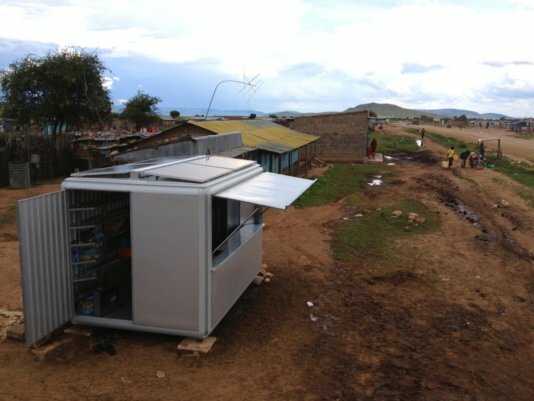 It can also serve as a water purification station, a place to store medicines in a refrigerator, a copy, print and scan station and above all a charging point using the powerful solar array on its roof. Another example of a SOLARKIOSK set up. The first SOLARKIOSK in Ngoswani. 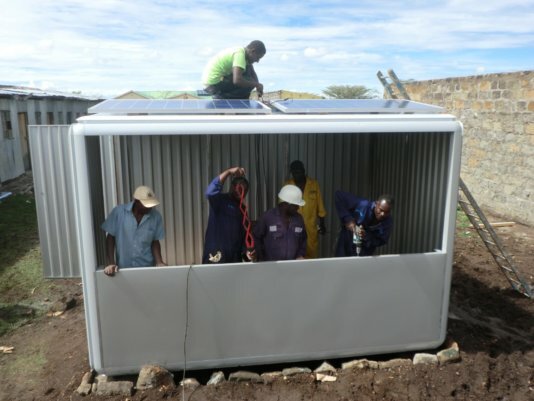 A team of workers in Kenya is working on putting up another SOLARKIOSK.